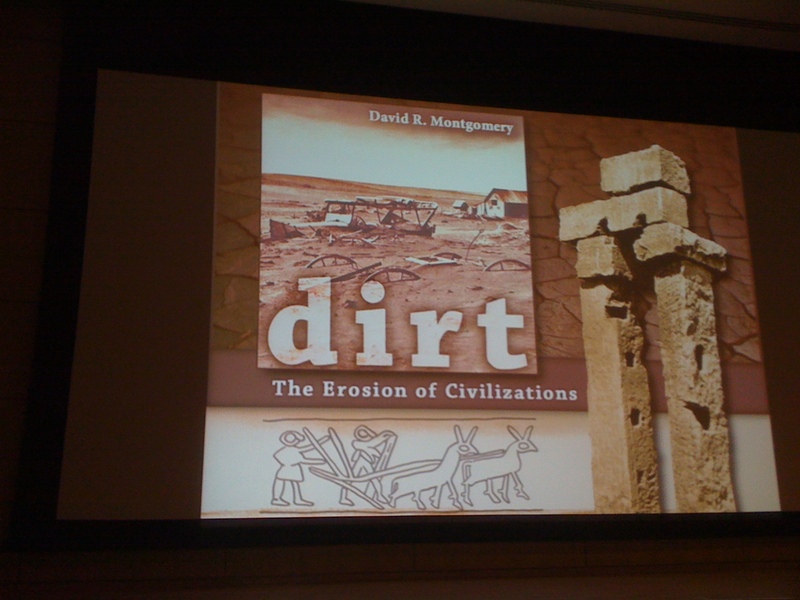 In the third of the Seattle Arts & Lectures series on the culture and politics of sustenance, UW geologist and Macarthur Fellow David Montgomery walked us through a few millenia of catastrophes caused by people abusing dirt. And in fact, he says, if we don’t knock it off, we stand to run out of fertile topsoil in only one or two more centuries. At the same time, the “fundamental condition for sustaining a civilization is sustaining soil and fertility.” Over and over again, civilizations from Neolithic Europe to the Easter Islands to the American Dustbowl have radically suffered or even disappeared as they have exhausted their soil. Remember that it can take 500 years to produce an inch of topsoil? Right now, the rate of erosion is one inch every 60 years. But if we change our agricultural practices, we can turn the situation around. And we actually already know how to do this! (–And have for centuries.) For instance, we could cut subsidies for erosive agricultural practices, and we could support no-till ag, terracing, and other soil-preserving strategies. To rebuild soil, you need to apply just two things, David says: organic matter and labor. Small labor-intensive organic farms are in fact the most productive in the world. But to get there from here, we need to alter our whole socio-economic model of food production: we need to stop treating soil as a commodity and start treating it as the fragile ecosystem that it is. This entry was posted in Events and tagged food security, soil erosion, sustainable farming by judyramey. Bookmark the permalink.